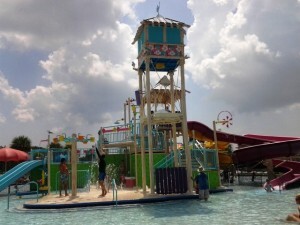 I wanted to take a moment to share my thoughts on Castaway Island Water Park at Topeekeegee Yugnee (TY) Park in Hollywood Florida! I will start by saying that I can’t believe I have lived in South Florida for so many years and never been here before! What was I thinking! The park itself is huge and the Water Park is huge too! There are 3 different sections a climbing slide area for everyone, a toddler pool with a slide and activities, and a huge pool. I liked that it did not have the 2 hour time limit of some of Broward County parks, so you can pay the entry fee and spend the day there! The pools were clean and well maintained. It was not a super busy day when we were there, but then again it certainly was not empty either and the bathrooms were pretty decent for a water park. I didn’t try the snack bar, but I saw people with all the usual pool snack bar items, the pizza smelled good and I am not really sure how we got out of the place without buying ice cream, but we managed. It was pretty quiet for us in the morning, however about the time that we left (2:00 pm) a camp group came in and there were long lines at the slides. This happens at all the water parks I have been to in the summer, The kids were good and there were no problems, however it was pretty packed then. Not sure if you can call ahead and find out what time the groups are coming on the day you visit or not. It is worth a try though, and worth the effort at any water park you decide to head out to. Castaway Island at TY Park interactive pool. The first interactive water playground area has all the required water park attractions, it has a dumping buckets lots of slides, and splash cannon areas on a climbing structure. It is big enough to entertain most kids (maybe not teens, but then again……..I thought it was pretty fun!). The part I really like is the toddler area. There is a toddler interactive pool playground with slides and water cannons. What is nice about this area is that it is completely fenced off from the rest of the water park. Castaway Island water fall in the zero entry swimming pool. The third area is the pool, and wow, it is truly beautiful! This huge pool is zero entry on one end and the other is a beautiful rock waterfall. Again, the place was immaculate! All in all, this park is certainly worth spending the afternoon. It cost us $8 each to enter and I think we had a great day! 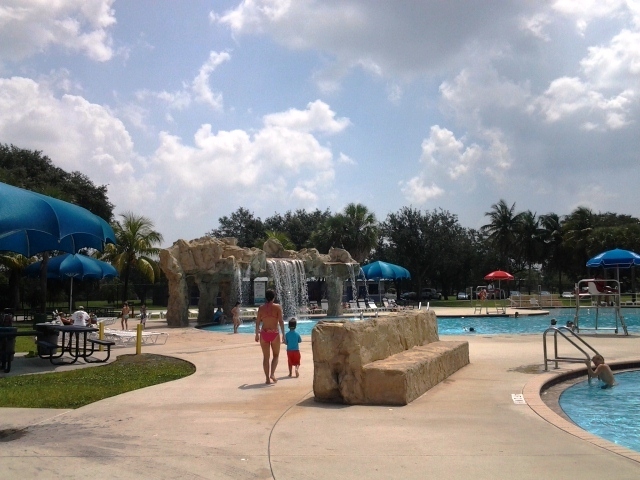 You have to love all the amazing parks here in South Florida! Castaway Island’s normal summer operating hours are 9:30 am to 5:20 pm, and is located at 3300 N. Park Rd, Hollywood, FL 33021. Please check with the park for current prices and hours before you head over as they do change seasonally. 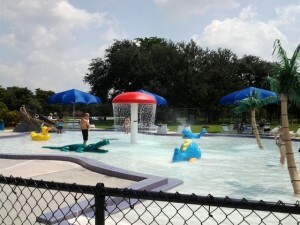 This entry was posted in Florida, Summer Picks, Uncategorized, Water Play and tagged Broward County, Florida, Hollywood, pool, Water Park, Water Playground, zero entry by Cynthia Buckley. Bookmark the permalink.